To access system settings, click System Settings in the left sidebar. Allows users to dial a local number without having to dial the country code first (e.g. +1 in the U.S.) and matches the ringback (what a caller hears while waiting for their call to be answered) to that region. This setting can be overridden on any line or conference bridge. Defines the language for system messages (i.e. voicemail menu [IVR]) for all phones on the system. This does not change the language for any page in the portal. This setting can be overridden on any line. Defines the dial by name directory accessed when internal users dial *11 from their Jive phone. Note: This does not affect dial plan directory nodes. Defines how long a parked call remains on hold until it is routed back to the original person who parked the call. Determines the required amount of digits (min=3, max=6) for all extensions. All system extensions must be of the same length. If changes are made to reduce or increase the extension length, the system will validate the new size to make sure there are no duplicate extensions or invalid extensions. If there are any discrepancies, a list of extensions with those errors will be displayed. Enables email alerts when a call is made to emergency services (U.S.=911, International=112). Defines the recipient(s) of emergency services email alerts. Tip: Using a specially formatted email address defined by cellphone carriers, emergency notifications can be sent via text message (SMS). Adds other numbers that trigger emergency service call notifications. Defines the default time zone used for the entire system. This setting can be overridden on any device or for voicemail time stamps on a line (including from the end user portal), ring group, and shared voicemail box. Three digit area code used before dialing a seven digit phone number (if dialing a number within the local area, you do not need dial the area code). This setting can be overridden on any line. Defines the default caller ID used for outbound calling. This setting can be overridden on any line. Defines the default hold music playlist used for callers that are on hold. This setting can be overridden on any line, phone number, or call queue. Defines the default corporate directory used on devices. This setting can be overridden on any device. Preserves the last search within a corporate directory, so the next time you view it, the results of your last search display (Polycom only). Allows a corporate directory to sync automatically (Polycom only). Defines the default Jive Business Continuity (JBC) setup used on devices. This setting can be overridden on any device. Outbound Proxy and Registration Proxy are disabled while using JBC. Defines the default outbound proxy with which devices configure. Defines the default registration proxy with which devices configure. Allows devices on your network to share information (location, settings, software/hardware capabilities, etc.) with other devices that use CDP. Note: Device discovery protocols are typically configured by Jive to accommodate certain network setups. Allows devices on your network to share information (location, settings, software/hardware capabilities, etc.) with other devices that use LLDP. A unique access key provided by Amazon S3 (copy and paste that value here). A unique secret access key provided by Amazon S3 (copy and paste that value here). The Amazon S3 bucket where recorded calls are to be stored (this bucket must be created first from Amazon S3). Enables recording of all incoming calls to the system. Recorded calls are transferred to the configured remote storage. Enables recording of all outgoing calls from the system. Recorded calls are transferred to the configured remote storage. Defines recording file format saved to the remote storage. Smaller file size (default, recommended). Larger file size, more compatible with mobile devices. If call recording is enabled system-wide or on a phone number and a call queue, multiple copies of the call will be recorded. The call queue will generate a recording that excludes the hold music, where the other recordings will include the hold music. If call recording is enabled system-wide or on a phone number and a conference bridge, multiple copies of the call will be recorded. The conference bridge will generate a recording that starts when the first participant enters and ends when the last participant exits. Additionally, a separate recording will be created from the perspective of each participant. 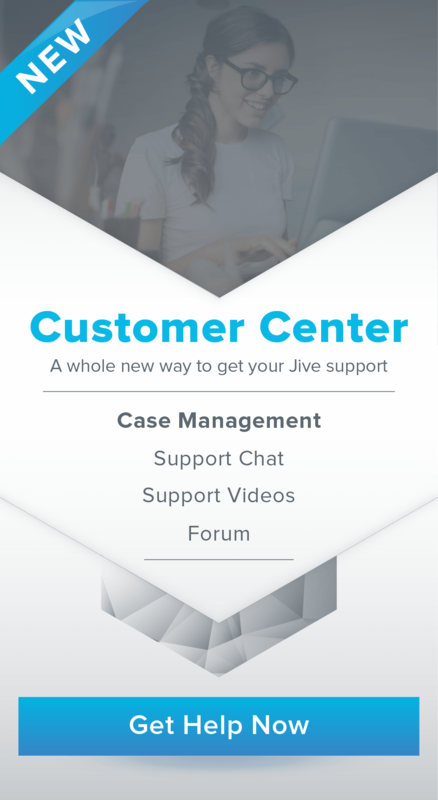 Learn more about Jive Business Continuity (JBC). Physical MAC address of the JBC device (a 12 digit string that is unique to each device). This is typically found on the bottom of the device. Name by which the JBC device is identified. This is useful when a system has multiple JBC devices. The internal IP address the JBC device is using. Use the following settings only if you have purchased Analog Failover (provides limited calling with external numbers, like 911, during an internet outage) and an ATA is connected to the JBC device. Specifies how many analog lines are connected to the ATA. These phone numbers bump existing calls to free up a line during an internet outage. You can add multiple numbers, but the list should never exceed the total PSTN Line Count. Note: 911 is included by default on all systems. You do not need to add it to this list. These phone numbers are always routed directly to the ATA and will pass through the PSTN rather than the Jive platform. Defines the outbound proxies with which devices configure (instead of the default Jive registrar). Host name or IP address of the outbound proxy. Name by which the outbound proxy is identified. Defines the protocol used during device configuration. If you have a proxy server running on your own local network, select the protocol that matches the one being used on your proxy. A connection-oriented protocol. Data is delivered unless connections fails. If the connection is lost, the server will request the lost part. There is no corruption while transferring a message. A connectionless protocol. Once data is sent, there is no way to know if it arrives successfully (it could get lost on the way). There may be corruption while transferring a message. Click to delete the outbound proxy. Click to view which devices are using the outbound proxy. Reroutes an extension or a range of extensions to a another extension (e.g. extensions 1240-1249 all dial extension 1100). Only unassigned extensions will follow these mapping rules. Defines the destination for the rerouted extension(s). Billing groups sort billable phone numbers (DIDs) and devices by group (e.g. site, department, accounting code) on your monthly Jive invoice for internal accounting and reporting purposes. Click to delete the billing group. Click to view which devices and DIDs are using the billing group.